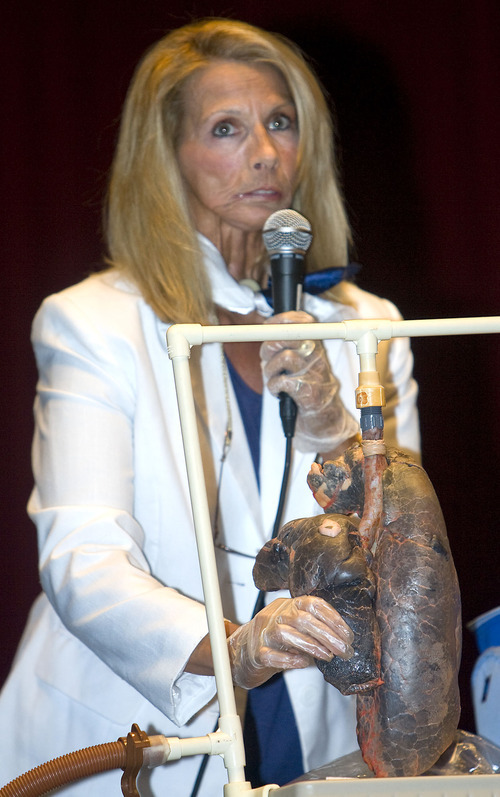 Al Hartmann | The Salt Lake Tribune Cancer survivor Terrie Hall inflates a blackened, diseased pig lung, (much like a human lung damaged by cigarette use) as she talks to students at Taylorsville High School Tuesday April 12 for the Utah Department of Health (UDOH) TRUTH Campaign She can't swim, blow her nose or speak – and she never will. Hall lost her voice box, breathes through a hole in her chest, and suffered through radiation and surgeries thanks to tobacco addiction. Al Hartmann | The Salt Lake Tribune Students at Taylorsville High School shake hands and thank cancer survivor Terrie Hall, right, after she gave a frank speech about cigarettte addiction and health at the school Tuesday April 12 for the Utah Department of Health (UDOH) TRUTH Campaign She can't swim, blow her nose or speak – and she never will. Hall lost her voice box, breathes through a hole in her chest, and suffered through radiation and surgeries thanks to tobacco addiction. Al Hartmann | The Salt Lake Tribune Cancer survivor several times over Terrie Hall points at where her voice box was before it was removed from cancer. 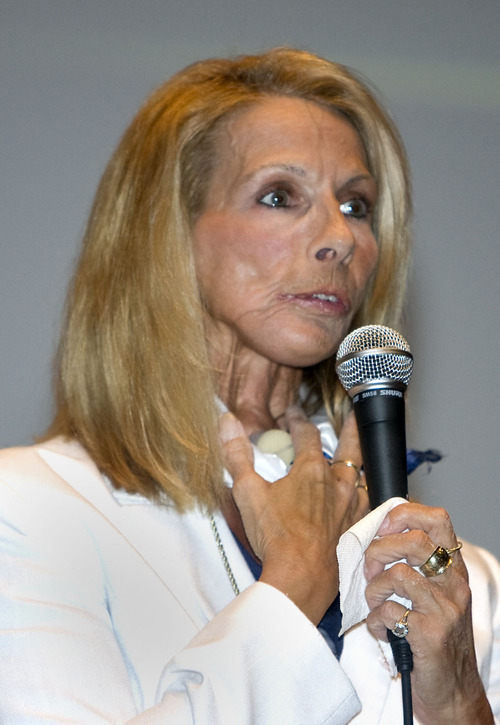 She spoke to a serious and subdued student body at Taylorsville High School Tuesday April 12 for the Utah Department of Health (UDOH) TRUTH Campaign She can't swim, blow her nose or speak – and she never will. Hall lost her voice box, breathes through a hole in her chest, and suffered through radiation and surgeries thanks to tobacco addiction. Al Hartmann | The Salt Lake Tribune Taylorsville High School students listen with all seriousness to cancer survivor Terrie Hall as she relates her cancers due to cigarette addiction Tuesday April 12 for the Utah Department of Health (UDOH) TRUTH Campaign She can't swim, blow her nose or speak – and she never will. Hall lost her voice box, breathes through a hole in her chest, and suffered through radiation and surgeries thanks to tobacco addiction. Taylorsville • As a teenager, Terrie Hall was a cheerleader who bent the rules. Although school athletes were forbidden to smoke, she would secretly light up with friends between classes. On Tuesday, she told students at Taylorsville High that impressing her peers wasn't worth the price. Hall, a heavy smoker as a young adult, has survived bouts with cancer in her mouth, throat, larynx and palate through radiation treatments and surgeries. Because her larynx has been removed and she now breathes through a hole in her throat, Hall can no longer blow her nose, sing a song or go swimming. "My lungs will fill up with water immediately [if her throat opening is submerged]," Hall said. "I can't even smell a cake baking in the oven." Hall, 50, spoke in a hoarse whisper with the help of a voice prosthesis and microphone. She also demonstrated an electric larynx that, she joked, makes her sound like Darth Vader. Hall is an anti-tobacco advocate from Lexington, N.C. The Utah Department of Health's TRUTH Campaign invited her to speak at 11 Utah schools this week. She also will be featured in campaign ads on television, radio and billboards. Ninety percent of smokers start before the age of 19, David Neville, the state's spokesman for tobacco prevention, said in an interview. "Getting kids to never start smoking is important," he said. "If you start smoking younger, you are more likely to be an addict later in life." In Utah, 8.5 percent of high school students said they smoked in a 2009 survey, compared with 19.5 percent nationally. 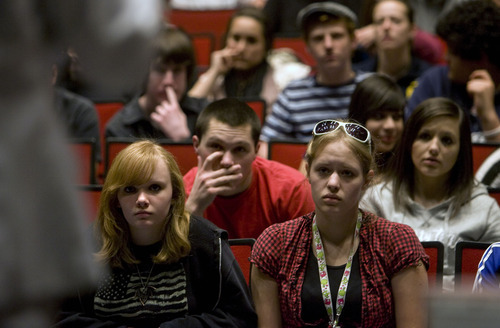 Twenty-one percent of Utah 12th graders said they had tried cigarettes at least once. For Hall, what began as a teenage hobby developed into a serious addiction. Smoking two packs a day became like a full-time "career," she said Tuesday. After she was diagnosed with mouth cancer, she continued smoking throughout her radiation treatments. She smoked her last cigarette 10 years ago, as she stood outside the hospital before her laryngectomy. Afterward, she realized she no longer could breathe through her nose and mouth. She couldn't inhale a cigarette. Hall showed students graphic images of cancerous sores on mouths and lips, and of one smoker who had been disfigured by surgeries that removed parts of his neck, jaw and face. "Smoking is nasty. I wouldn't risk my face for that," said Taylorsville sophomore Sbeidy Mora after the assembly. "When girls do it, I think it's trashy. With guys, it's unattractive." At the time Hall was in high school, she said, there were designated smoking areas on campus. At Taylorsville High, signs on school doors warn students that smoking is banned anywhere on school grounds. "If being different means saying 'no,' then just say 'no,'" Hall told the Taylorsville students. Erick Saidi, a junior at Taylorsville said in an interview that he tried smoking a few years ago but called it a "bad decision" and stopped. Hall's speech, he said, inspired him to encourage his friends to ditch tobacco. "It's better to quit before the problem gets bigger," he said. "She had an impact on me so I bet she will have an impact on other students as well. … She's helping other people not go through the same thing that she went through."